Wooden Desktop Holder Set available here. 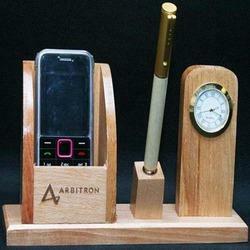 Displaying a wide range of Wooden Desktop Articles like pen holders, Clocks and other accessories. Our range adds grace and beauty to the desktop. We offer these items in various shapes and in various dimension. These quality desktop articles are manufactured using optimum quality raw material. Being a blend of luxury and elegance, this range is offered to our clients at economical cost. 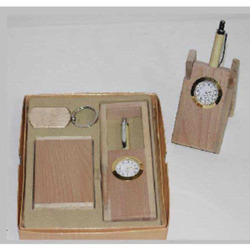 We are widely acknowledged amongst our customers by providing a qualitative array of Wooden Desktop Set. Our complete range is designed and fabricated under the guidance of our skilled professionals keeping in mind the prevailing trends of the market. New arrival Wood Desktop Gift. Crafted in white wood with hand carving work. utility pen holder as well as decorative peace for home and office. A Wooden Desk top is a must for any study table and work station in any office. It not only keeps your things in a well systematic way but also makes you organized and systematic. It is an ideal gift not just for working adults but also kids who study and always need a pen and clock to maintain their schedule.